Retinoblastoma: A tumour of the retina that affects young children. Do you have a story to share with the press? Help those in a similar situation, raise awareness, and earn money for yourself or a charity. This week a SellUsYourStory.com client shared her story of Retinoblastoma to raise awareness, a tumour of the retina that affected her daughter. If you have a story to share with the press, whether about Retinoblastoma or anything else, get in touch today. Simply fill out the Story Valuation form on this page or call our team. Turning the key in the lock I slowly pushed open the door to our new home. The floor was carpet-less, the walls needed a lick of paint and the light fittings were just bulbs swinging from the ceiling. It wasn’t perfect by any stretch but it was home. It had been left in a terrible state by the former contractors with exposed wires and poorly fitted floorboards letting draft in, but I tried to see past all that and look at it as the first home for me and my little family. Mum Emily and her daughter Chelsea. “We’ll have this place looking like a show home in no time,” I said to my baby girl Chelsea as I held her in my arms, showing her our new surroundings. Seven years later as well as Chelsea, eight, I have two more girls Chloe, six and Emily three. Everything moved on apart from the house itself. I tried my best to keep the place looking nice, but as a single mum with three kids DIY improvements proved to be hard-work and very costly. 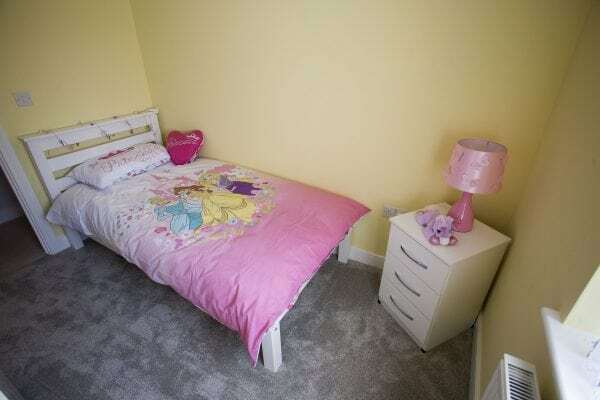 I’d give the girls’ bedroom a fresh lick of paint every now and then to help brighten the place up, but I couldn’t afford for any of the major building work that desperately needed doing. The girls never complained and it never affected their playtime. 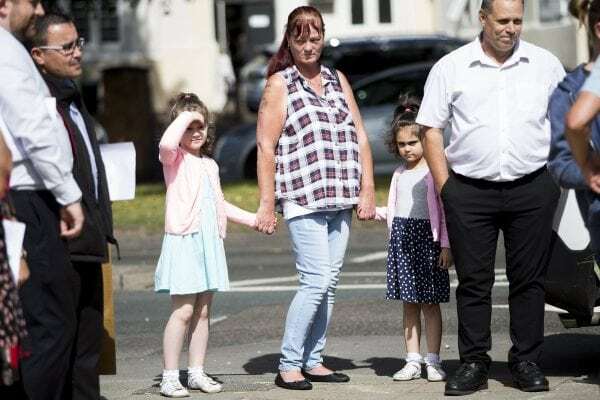 The three of them got on brilliantly, which made it very easy for me to spot when my youngest Emily started to become very quiet and withdrawn.One afternoon I sat her on my knee and tried to read her favourite book but she just pushed out of my hands and tried to wriggle away. “Hey, what’s the matter?” I asked. Emily wouldn’t even open her mouth to reply. She was only two years old and had quite a good vocabulary for her age, but it was like she’d given up learning how to talk already. I just couldn’t get a word out of her. I sighed worrying that I’d never had these behavioural problems with the other two. The following morning as I was feeding her breakfast in her high chair, I looked Emily straight in the eye and gasped when I spotted how grey her eyeball looked. I observed it over the next few days and the white seemed to get even duller in colour. The family surprised by their new home. Desperate for answers, I waited till the kids were all in bed one evening and I sat on the sofa with my IPad and began googling Emily’s symptoms. A loss of interest in things… refusing to talk… change in eye colour…. Then I saw flash up on the screen, Retinoblastoma: A tumour of the retina that affects young children. The IPad fell from my hands and I froze in fright. No. It can’t be that, I assured myself, shaking my head in disbelief. That night I couldn’t sleep for thinking about what I’d seen. I lay awake tossing and turning until morning when I could call our GP and book Emily an appointment. “I think it’s just a squint,” the doctor assured me, as he examined her eye the next day. Two weeks after that appointment Emily was due for her routine health visitor check. As soon as the nurse looked at Emily she agreed she could tell something was off with her eye. “I’m going to refer her to the hospital for them to have a look at this,” she said, making notes. Four months later Emily and I were called to Hartland’s Hospital in Birmingham for tests. A member helping put the finishing touches on the house. A fortnight later I received a phone call asking me to come back for a meeting with a consultant. I had a gut feeling something must be wrong so I brought my mum along with me for support. “I’m afraid I have some bad news,” the doctor said. I held my breath and gripped the arms of my chair. I felt my heart sink. I’d heard of the condition from my own research, but hearing it out loud from a health professional was completely different. This time it was real. My mum put her arms around me, but I felt like my whole world was falling apart. Emily had been in so much pain for months and hadn’t been able to tell me. “My poor little girl,” I sobbed. The consultant explained that Emily’s condition was so serious that she would need treatment right away. I didn’t want to worry her or her sisters too much so I sat them down together and told them that Emily had a poorly eye and needed some help at the hospital to get better. To help her understand what was going on the nurses gave Emily a lion teddy bear that she named Ollie. The Cassidy family who have recently been in America receiving treatment. Whenever I took her to chemotherapy I popped Ollie in my handbag and brought him out for Emily to cuddle and remind her of how strong she was being during her treatment. When Emily’s hair began to fall out Ollie the lion’s detachable mane was taken off too. “See, he’s still just as beautiful and brave without his hair,” I told her. Despite the treatment, the severity of Emily’s cancer meant that her eye had to be removed. My stomach dropped. “Then we have to do everything we can to help her,” I said. Rather than feel sad about Emily’s eye, I tried to feel relieved that something was being done to help her. As usual Emily was so brave about it all and with Ollie to cuddle she didn’t cry once. But just weeks after the operation in March 2016 we were given the heart-breaking news that the cancer had spread. But it wasn’t all bad news. The doctors told us about a treatment called Proton Beam Therapy that could target the cancerous cells without causing too much damage to the surrounding tissue. It was funded on the NHS but it was only available in the U.S. It would mean Emily and I would have to move out there for nine weeks. We were told it had a 95 per cent success rate so it was too good an opportunity to refuse. I’d never been without my girls for longer than a day since they were born so I knew I’d miss them. My mum promised to look after Chelsea and Chloe while we were away. In July I Emily and I packed our bags and headed off to Jacksonville, Florida. One of the new bedrooms. Although she was having grueling treatment and had to spend long days in the hospital, Emily loved being over there. The staff at the clinic were so good and treated her like a princess. After nine weeks of intensive treatment Emily and I were told we could finally return home. As we went to sleep on our last night I didn’t feel excited to leave the nice villa we were staying in and get back in the dingy house but I was very excited to see the girls and so was Emily. We flew straight into Birmingham airport where my dad was waiting to drive us home. As we neared our house I noticed Dad take a left at the wrong junction. “Dad you’ve missed the turning,” I said to him. “We’re not going that way,” he said, eyes firmly on the road. “Err well we should be because that’s where I live!” I laughed. “I know. But you’re going to be staying with us for the time being,” he said. “What? Why? What’s going on?” I asked confused. “Just trust me on this one,” was all he would say to me. Eventually we reached my mum’s house where I spotted the girls looking out the window for us. They came running out the door to hug me and Emily. It was amazing to see them but I was still confused about what was happening at home. “You’re going to be staying with us for a few days,” mum said. She and my dad remained tight-lipped about what was going on. I don’t drive so I couldn’t nip round myself to find out what was going on and it was miles too far too walk. I was in the dark until a week later when finally my mum said we could go home. We packed our cases up and loaded them into the car. As Dad drove us down our street my jaw hit the floor in shock. There were about 50 strangers standing on my driveway. “What on earth! ?” I cried. Then I spotted a face I did recognise, a lady called Georgina Mosely. I’d met Georgina at the hospital through Emily’s treatment. Georgina’s son Harry tragically passed away in October 2012 after he battled a brain tumour. Georgina set up a charity called Help Harry Help Others in his memory to help the families of other young children going through cancer treatment. When I stepped out of the car I noticed lots of people were holding up their phones to film and take pictures of me. There was even a film crew there. “What is going on?” I asked to all the beaming faces. Georgina took my shaking hand and led me into the house where I was given the fright of my life. The whole place had been completely transformed. “This isn’t my home” I said looking around at the revamped living room. Everything was completely new from the lights, to the blinds and all the furniture. The kitchen had been completely refitted too. “It’s like a show home!” I gasped admiring all the shining surfaces. Then Georgina and the team of volunteers who’d helped her completely renovate our home, led us upstairs. Our bedrooms had been completely done up too. I barely recognised mine and the girls were over the moon with their new pink Princess bedroom. “Is this our house mummy?” asked Chloe. The family were so happy to return from Florida to see their new home. “I think it is,” I laughed. The interior has been thoroughly rewired and re-plumbed, the back garden has been landscaped and the front drive has been block paved. Georgina and her incredible team of volunteers had been working tirelessly since we were away to give the house makeover that cost £60,000. Apprentices from Birmingham’s South & City College worked on the project with local suppliers and contractors, and the house was even given a new extension and roof. I was astounded at their generosity. “I can’t thank you enough,” I said to Georgina with tears in my eyes. 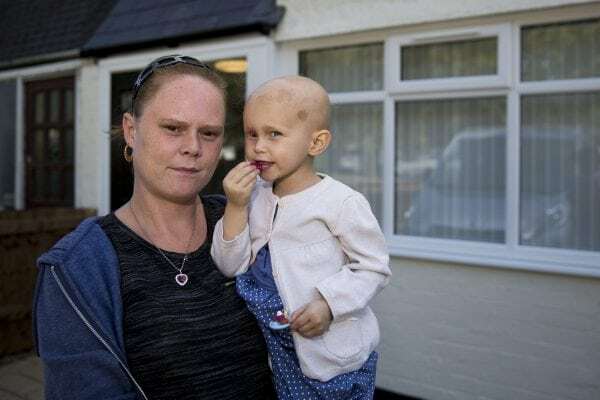 It hasn’t changed Emily’s condition, she will continue to have chemotherapy every 20 days but now she will have somewhere safe and clean to come back to after her treatment and that will make the world of difference to her recovery. If you would like to learn more about how to sell a story to a magazine or a newspaper, read our Sell My Story page.